We never use it so we want to make it appealing and brighter. I am getting rid of the sofas. We remodel the house couple years ago and now we need help with it. 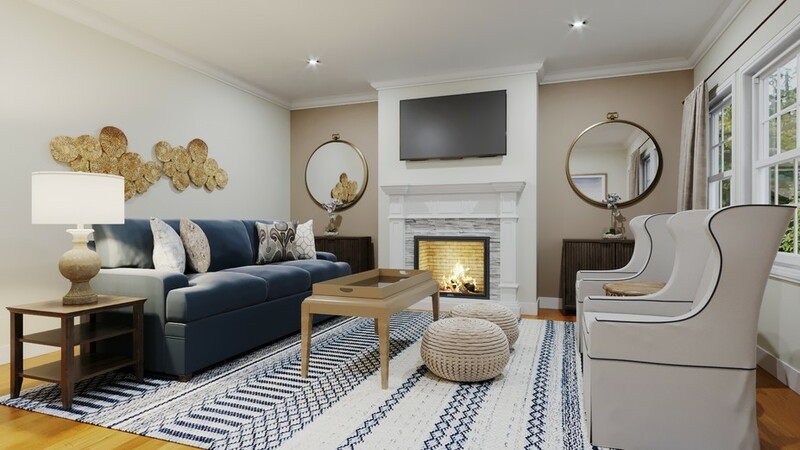 Our formal living room need all new furniture and decorative pieces. 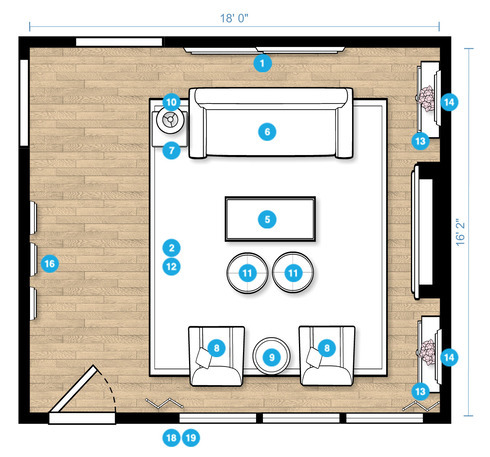 The family room need a new layout for the living area and new accessories to define our personal style. 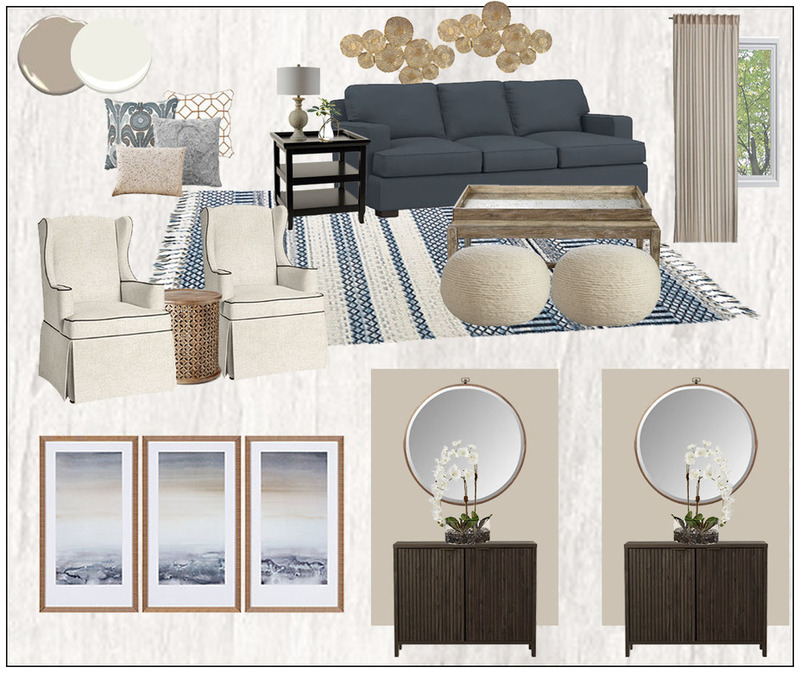 For all the three areas (formal living, family room and entry) the color palette that we prefer is with light grey and teal as the accent color. 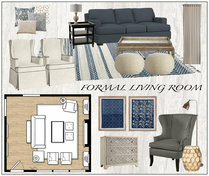 *I think that I would like to make the front living room a formal dining room with a seating area. Thank you for everything. We love it. Ensure that a sample paint swatch has been tested on the wall so you can see what the paint will look like. I also recommend purchasing a sample that is a bit lighter and darker so that you can compare at least 3 colors to your wall. Carved Wood Large Side Table, Natural Mango (834796) Sculpture on the side. Inspired by a ceremonial African stool, this Carved Wood Side Table's intricate texture is hand hewn by artisans in Jaipur, India, from solid mango wood. Natural color variations make each piece subtly one of a kind. Discount link available to project holder only 20"diam. x 22"h.
Forty West Ellis Natural Carved Faux Stone Table Lamp An oatmeal linen shade complements and softens the faux stone look of this beautiful transitional table lamp. Discount link available to project holder only 32" high x shade is 17" wide, 10 1/2" high x base is 6" wide x 18" high from base to bottom of shade. Quantity: 2 Impromptu seating for social circles. Ropey bands of boiled wool are twisted and wrapped in a mesmerizing coil with soft, organic texture. Dense poly-filled round is substantial for seat/ottoman duty. wool wrap natural pouf is a CB2 exclusive. Discount link available to project holder only Width: 20" Depth: 20" Height: 14"
W3353 (W3353.511) FROM CANDICE OLSEN COLLECTION BY KRAVET Discount link available to project holder only Width	27" Vert. Repeat	24" Horz. Repeat	27"
Quantity: 2 The soft, nubby texture of our Emery Linen Drape brings a casual warmth to the room. Yarn-dyed, this drape is made with two differently colored threads, creating soft, subtle texture. Discount link available to project holder only 50" X 96"